It was a day preceded by a thunderstorm and ended on a sad note with a serious injury. I won't get into the injury status as I don't know how serious the injury was but it's a terrible way to start the season. The offense didn't take long to get started as Hurts hit a couple of long passes for TDs but the defense had some big moments as well. Those long passes were just two plays that worked but the defense handled themselves well as a whole. Tua had his moments also with some very well placed passes for completions for touchdowns. If there was one bright spot that caught my eye it was the running of Josh Jacobs, it was so good to see him back on the field. The defense is working hard to find replacements for all of those that didn't return this year and there are some young ones that are putting in a good effort to earn their spot on the team. The season is just getting started and they looked about like I thought they would, there is worked to be done to repeat as National Champions. If there is a weak spot right now on the team I would say it is the punting game, there is work to be done there but I thought the place kickers did a pretty good job though. I think the punting game will improve in time and we all have to remember that there isn't many J. K. Scotts out there to choose from each year in recruiting. J.K. really spoiled us the past 4 years and it might take a little while to find that quality punter. 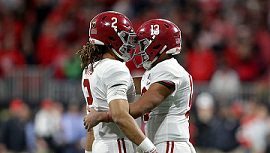 Bama won another National Championship last year but it didn't come easy as there were two or three games that the team were very fortunate to win and I think that might be the same case this year as the team may struggle some until the younger inexperienced players mature while the veterans carry the load. Last year the team was terribly hurt with key injuries all season that really hurt the team but this year with the lack of that experience this year this team must not have a repeat of those injuries to repeat as champions. Offensively I think Bama will be better with so many players returning with that much needed maturity. Looking at what was lost on defense the offense will have to carry the load this year for a while. Tua and Hurts are a great combo and there is a stable full of running backs and receivers returning so maybe they can put up some big numbers until experience can be gained by the young defense. There was good effort with lots of intensity on both sides of the ball today which shows the players have a good mindset toward reaching their goal of another championship in 2019 and with a little luck and some good team leadership from the players, they just might repeat. RTR!!! Thanks for the comments on the team Jamos. very interesting. I wish you would identify the player that you referenced as getting injured though. Also, was there anything that might indicate in your mind which qb might get the initial start against Louisville? Thanks J, for the report. Sounds like a lot of young, talented, inexperienced talent on defense. Looks like another promising year if we can limit the injuries. NALT, Chris Allen was the player with the serious knee injury. Looks like he's out for the year. The LB corp is pretty thin in the depth department right now. NALT there is no doubt in my mind that Tua is the best passer but I think Hurts has the best feet to run the ball. I think it will come down to what kind of defense that Louisville throws against them as to which QB has the better chance to move the ball against them. I would really like to see the offense go back to running the ball more with all of the good running backs they have. I think Bama will need to manage the clock a little better this year until the defense gets it going good and hopefully that will be real soon. They need to keep their offense on the field as much as they can. e-cred JAMOS for that great report. l look forward to hearing maybe one more as I know you can't unleash the good stuff. I have a great brother who is in the RE club in Gadsden and he won't give me any of the good stuff. I hope the QB situation only pushes the 2 QB's to get even stronger and better. Now my big question is: How is Mack Jones doing in being a good backup? RTR! Thanks Jamos. I always look forward to your inside information and first hand observations. I look forward to seeing you at a game this year. Jamos -- I was looking forward to your report and you did not disappoint. Your point about the O needing to control the clock -- I call it controlling time of possession -- is a good one. Another 5-mins of possession can make a difference to a young D. But which QB is better able to run a grind-it-out O ?? I say Tua 'cause he's a more accurate passer for those 3rd & 4 situations. Or 4th & 4 when you need to maintain possession in 4th qtr. LB is very thin already. Not good. We really need some guys to stay healthy and step up.